The BBC has formally introduced the new version of iPlayer for viewers with BT Vision, the last major TV platform to receive the new version of the service. BT subscribers using the company's other, YouView based service have had the new iPlayer for some time. "This is a very significant milestone for the BBC as it marks the last major platform to move away from the old server stack we used to power BBC iPlayer with to the new version of BBC iPlayer, which features 30 days availability, access to exclusive programmes only on BBC iPlayer, the Radio 1 video channel and collections. We’ve worked very closely with BT to help them improve the browser that runs on this device so it will run BBC iPlayer on TV." 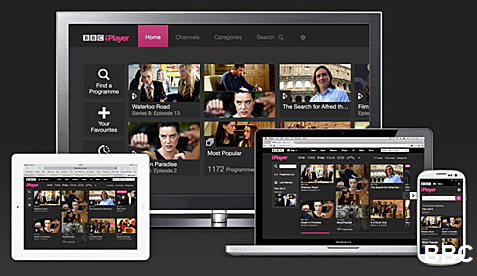 The changes to iPlayer were part of a move by the BBC to reduce the number of versions of the service it was running on various TV platforms from eight to one, making the service easier to maintain and update. Audio Described video - a new category grouping all programmes available with audio description - a service for the blind or partially sighted. Live channel playback - enabling viewers in poor signal areas to watch BBC TV channels live via the iPlayer instread. Writing on the BBC Internet Blog, Peter Lasko confirmed that the feature would be coming to Microsoft Xbox One and Sony Playstation 4 soon. The new version of iPlayer that has been rolled out notably omits BBC Radio, with radio spun-off into its own iPlayer - iPlayer Radio, which isn't carried on connected TV platforms. And a right pain it is too that iPlayer no longer includes radio. Why am I prevented from using BBC Radio catchup on my Freeview PVR when I used to be able to do this and I still can for TV? Thanks for the article. For those who live outside UK and want to access BBC iPlayer, you can use UnoTelly as I do to get around the geo block.